Majordomo Review 2019: Is Majordomo a Good Hosting? Majordomo provides web hosting and domain registration services to customers in Russia and other Russian-speaking countries. They are among the top ten reliable web hosting providers in Russia, with more than 40,000 certified individuals and businesses as customers. 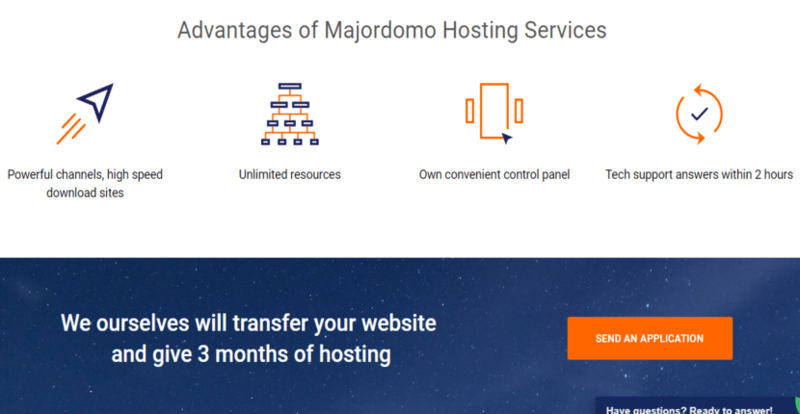 Majordomo has provided web hosting and domain registration services to customers in Russia and other Russian-speaking countries since its founding in April 2000. As a provider of Linux-based low price shared web hosting and VPS, they are among the top ten reliable web hosting providers in Russia, with more than 40,000 certified individuals and businesses as customers. Their corporate shared packages also provide legal assistance for the protection of intellectual property. Majordomo’s website is only in Russian, but it translates quite well in-browser into English. Majordomo offers several shared hosting plans for individuals and businesses. The basic hosting packages are suitable for individuals and small to medium-sized businesses whereas the corporate plans are a good fit for those – such as legal entities, government departments, and some large e-commerce businesses – that need legal assistance and separate servers. Unusually for a web hosting provider, Majordomo does not keep statistics about its uptime and consequently does not offer any SLA in this regard. Majordomo offers a very user-friendly home-grown control panel rather than the industry standard cPanel. I tried it, and I liked it. Via this control panel, you can get your SSH key and configure Cron jobs for scheduled tasks such as backups. They also have a website builder and one-click installer for WordPress, Joomla, 1C-Bitrix, and OpenCart. Since those CMSes require PHP, you can use them on all but the basic package that only supports Perl. Higher packages support PHP, Ruby, Python, and CGI in addition to Perl. Programmers with a preference for Windows OS will have to look elsewhere because this hosting provider only runs Linux servers. The final plus for this provider is their DDoS protection that protects you against distributed denial of service attacks via a blended approach of detection, classification, and blocking. The shared hosting packages are cheap, which is surprising given the extras you get including free SSL certificates on some plans. If your customers are in Russia or you’re otherwise interested in a .ru or .rf domain, you’ll get a free domain registration. Their 14-day free trial lets you host your website and have your emails running for two weeks without even having to connect your credit or debit card. Upon each renewal, you also get 14-days grace rather than being cut off immediately when your plan expires. Majordomo’s VPS packages are very cheap, and you get 5 GB backup space in a dedicated server. And if you’re transferring your website to their servers, you get three months free hosting. Support staff can take anywhere from 30 minutes to two hours to reply by email. Note that if you email this company and you don’t speak Russian, you’ll need Google Translate on hand to interpret their instructions. They also have live chat, via which I received rapid responses to my questions. Majordomo offers web hosting servers at low prices. Both beginners and experts will enjoy the one-click CMS installation, in-depth help center, and support for a plethora of programming languages. Check out Majordomo’s web hosting options today! Wondering how Majordomo stacks up against other Web Hosting companies? Enter any other Web Hosting company and we will give you a side-by-side comparison.